One of the most curious stories circulating on the Internet, is the existence of an artificial satellite orbiting the planet every 15 or 20 years, known as “the black knight”. The story goes back to 1899. Around this time, Tesla moved to a laboratory in Colorado Springs to start his experiments with high voltage and electric field measurements. During the eight months he was there, he spent part of his time to developing small signals and receivers measure the ability of a vertical antenna. During his tests, Tesla caught a periodic signal coming from somewhere in space. But it was not until 14 May 1954 when the history of the satellite of unknown origin took shape. In the newspaper “St Louis Post Dispatch” and the “San Francisco Examiner” were two articles in which the presence of two satellites in orbit around our planet at a time mentioned, lest we forget, in which no nation none had yet set (Sputnik was launched at the end of 57). In 1960 both the Soviet Union and the United States already had satellites in orbit, but on February 11 the alarm went off again, as it detected one not identified in a polar orbit, that neither the Russians nor the Americans recognize as their own . Was it again the black knight? Three years later, Gordon Cooper was launched into space to make the mission to circle the Earth 22. In his last orbit, reported seeing a light in front of his capsule. It is said that the Muchea tracking station, in Australia, caught the radar echo of the object reported by Cooper. They say that the version of NASA is that the ventilation equipment malfunctioned and excess CO2 did see hallucinations astronaut. At the time this mysterious object has already called him “the black knight”. Start here. Our house is in Boötis Epsilon, which is a double star. We live on the sixth planet of seven of the larger of the two suns. The sixth planet has a moon. Our fourth planet has three. Our first and third planets, one each. The probe is in the position of Arcturus, as our maps. 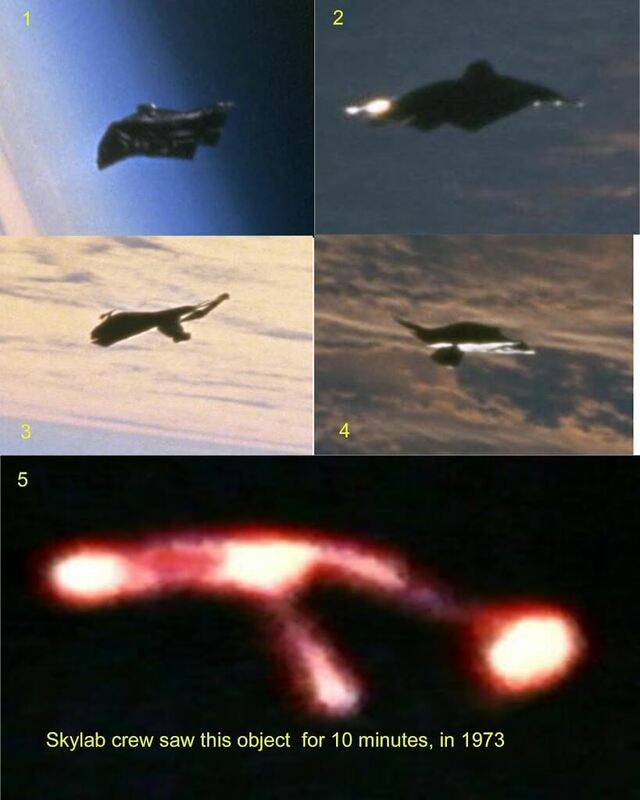 According to NASA, what you see in these images are remnants of the shuttle itself. Is it true that a satellite orbiting the Earth, thousands of years old, issuing an invitation for a meeting between civilizations? Why are we hiding? If you like this kind of stories, do not read, but if you prefer to know the truth, you should. In 1899 Nikola Tesla caught the signal from a pulsar. A pulsar is a neutron star that periodically emits radiation. Pulsars have a strong magnetic field that induces the emission of these pulses of electromagnetic radiation at regular intervals related to the rotation period of the object. In fact, in 1967 when Jocelyn Bell and Antony Hewish officially discovered the first pulsar, also believed they had contacted an intelligent civilization, since the frequency of the signal seems to eliminate the possibility of a natural phenomenon. News of 1954 in which the existence of one or two ships stated to be orbiting Earth are, if we read them, sarcastic notes you talking about Donald Keyhoe, a pilot in the U.S. Army, who became famous in 1950 by stating that the United States was conducting experiments on UFOs, and for that year was promoting his book ” Flying Saucers from Outer Space“. To do this you will not think of anything else to testify that the Secretary of the Air Force was aware of the existence of these two ships, which was immediately denied, as described in the articles. (Pinchad on the picture to enlarge it and to read it). The Discoverer were a series of reconnaissance satellites that were launched between 1959 and 1972. On August 14, 1959 the retrorocket the Discoverer VIII was activated from the ground but the ship was not in the correct position and what happened was that instead of decelerate and enter the atmosphere, it shot to a higher orbit and went missing. The network scanning satellites Dark Fence, which was put into operation in late 1959 this object detected in February 1960, but a few days later got identified as the Discoverer VIII satellite lost months ago. This article (also published in media such as Time, in references) is rarely cited in the websites that talk about the Black Knight. Gordon Cooper saw no UFO in his space mission. He always refused, as we read in the journal Space . The interpretation of LDEs (echoes of long delay) by Duncan Lunan, it is still an exercise in imagination. When a signal to the atmosphere, releases sometimes reaches an echo returned after a period of up to 15 seconds.The delay is so large that can not be attributed to weather conditions or magnetic storms. So far the cause is still not entirely understood, but the interpretation of the randomness of the echoes can be done in the way that most interests. The DSLs are due to an atmospheric phenomenon that will soon understand. Images from NASA are plastic, leftover wrappers and even hats left in the cargo compartment of the shuttle, and go out into space when the floodgates open cargo hold. So in 2010 I responded to a message I sent to JPL to ask for a similar object photographed on the STS-98 mission. The objects moving at low relative velocity with respect to the ship, like the one pictured in the STS-88 mission, from the same ferry. Thank you for your message. After reviewing the image, and the frames in the sequence Preceding, our review Is that the point light spots are reflections from space debris released from the Shuttle Payload Bay. Small, unsecured objects into the Bay Introduced During prelaunch processing of the orbiter – pen: such as covers and baseball caps – can be released When the Bay doors open for mission activities. Mission-related activities,: such as release of experiments or satellites, Also can release small debris from the payload bay. The Low Earth Orbit region (up to 2000 km above the Earth’s surface), in Which the Space Shuttle and International Space Station operate, has the highest concentration of space debris. While some of this debris is Comprised of spent rocket boosters and defunct satellite fragments traveling at high velocities relative to the Shuttle or International Space Station (10-11 km / sec), objects moving slowly enough to be photographed by the crew of the local origin are , and are traveling at relative speeds less than 1 meter / sec. This type of space debris presents no danger to Typically the spacecraft or crew. This website (http://orbitaldebris.jsc.nasa.gov/photogallery/beehives.html # leo) Provides graphical representations of the tracked space debris in orbit around the Earth. Thank you for your interest in astronaut photography of Earth! The photos were never deleted. The published references that fail, use the ftp protocol instead of http. You may would change directory and therefore fails to access via ftp.